I am LOVING Pinterest. There are so many yummy recipes to try, household tips to learn, and super creative ideas to be found. 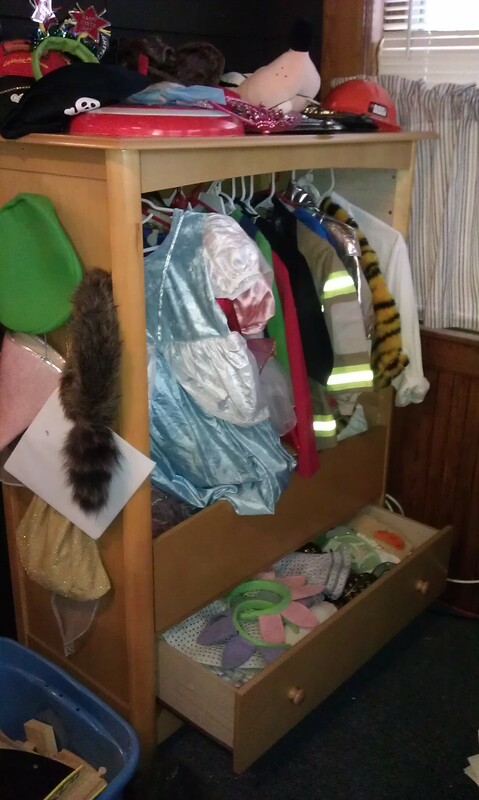 One such idea was turnning an old dresser into a dress-up box. We happen to have a few old dressers hanging around, so I showed Mike the picture and – handy man that he is – he upcycled it! He took all of the drawers out except the bottom one, put a bottom over that drawer, secured one of the drawer fronts to that bottom to make a bin, added a rod to hang clothes, took all the extra knobs off, and put those knobs on the side to hang the hats. I think it turned out so great! We need to add a few more spots to hang hats, but other than that – LOVE IT! !